Glenys Gill (nee Andrijasevich) started at TVW Channel 7 in 1969, to join the elite team of secretaries employed by Seven. They had to be elite as Managing Director Sir James Cruthers insisted on perfection, when it came to the typing of letters and memorandums. He was trained as a journalist and possessed well tuned shorthand skills, enough to intimidate any stenographer, as he could read their notation upside-down and correct them. “I remember her first day at 7 … it was October 15, 1969 …. I only remember that, because the next day was Channel 7’s 10th birthday, and Frank Moss went around and gave everyone a card with $10 … and the girls received a corsage…! 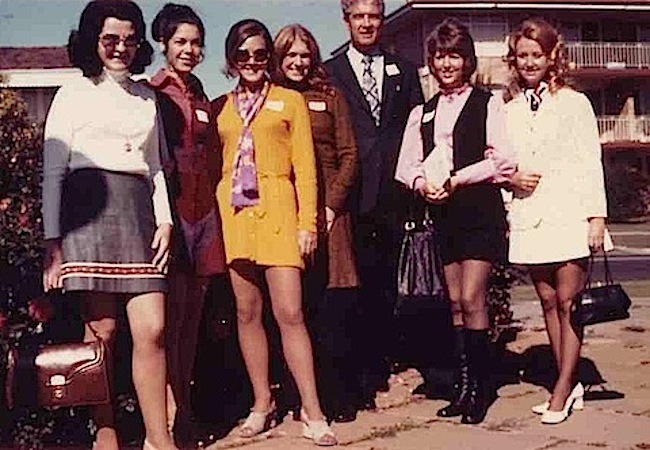 Jill Norton (Korbosky) talked about the happy times at London Street in Mount Hawthorn, as school girls, before both joined TVW as secretaries. 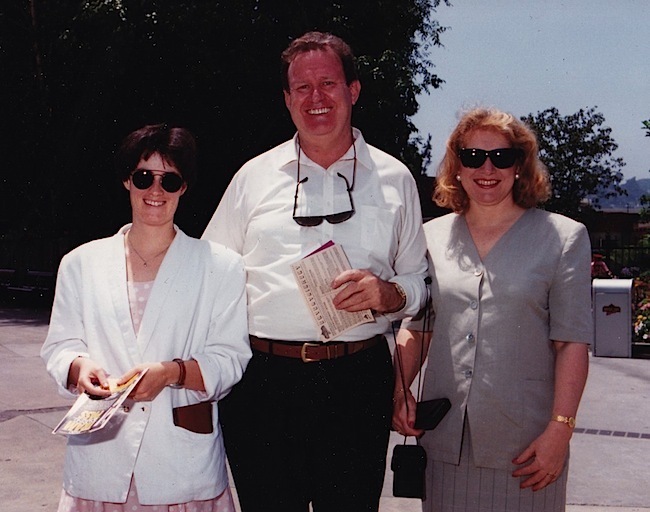 Jill as secretary to the Sales Manager Greg Byrne and Glenys as secretary to the Program Manager Bill McKenzie, to later become his assistant at Seven, before Bill became Group General Manager of TVW Enterprises Ltd., Managing Director of ATV 10 Melbourne, Chief Executive of Network 10 and Managing Director of NEW-10, where Glenys joined him as Program Manager. “My tribute to Glenys, a very special LADY. What a tragedy to lose such a beautiful person. Those who knew her will suffer an enormous loss and those who knew her were blessed. Glenys had magical qualities about her. She had the most amazing gentle, thoughtful smile. Her warm eyes reflected her inner peace, wisdom and understanding. When Glenys spoke it was worth listening to. And when one spoke to her, she really listened. There was a soothing, laughing quality to her voice. Glenys quietly achieved from a young age, as marching girl for a number of years at State level, followed by netball at National level and in latter years played Masters Netball. She never did things by halves as her self discipline was so great. She joined the TVW7 Programming Dept where she excelled, before moving to the executive team of NEW 10. Glenys and her family lived opposite me in Mt Hawthorn from early childhood until our 20’s, when her family moved to Yokine. Together with her sisters Lilyan and Dianne, we had loads of fun growing up with the Andrijasevich’s (Andrays). We played in the park opposite, went to the pool and beach and pictures at the Menora cinema. We did lots of other girly things in those days. I always admired her dedication to netball practice and her hours of shooting goals into the netball ring attached to their garage. It was a fortunate day when we again spent some time together recently at the last TVW get together . Glenys worked in the TVW Program Department from 1969 to 1974 then part time from 1974 to 1984. 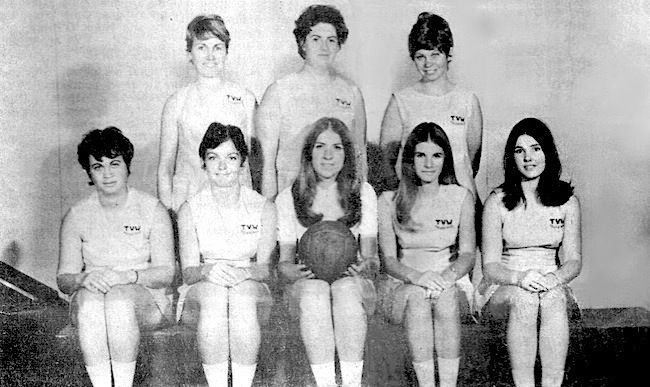 TVW also established a series of Netball teams with the first being called the TVW Telebirds in 1970, with Glenys as the coach. “We did win the best dressed team if not a game, and not due to Glenys Gill’s fine coaching, but probably due to the late Friday nights drinking with the crowd after work”, explains Maureen Iustini (nee Burgwyn). In 1972, Glenys married another sportsperson, Motocross participant Rick Gill, who won three first places and several seconds and thirds in the State Championships during a twelve year period, to more recently take up car racing, and win the 2010 WA State Saloon Car Championship. They produced a son Rowan, who with partner Beth have a grandson Reon, then Rick and Glenys had daughter Tegan, who with husband Cameron have two grand-daughters, Ella and Asha. Rick and Glenys also supported Rowan’s Aussie rules football activities at the Hamersley Carine Amateur Football Club (Rowan is now a Motorcycle Dealer with the family company). 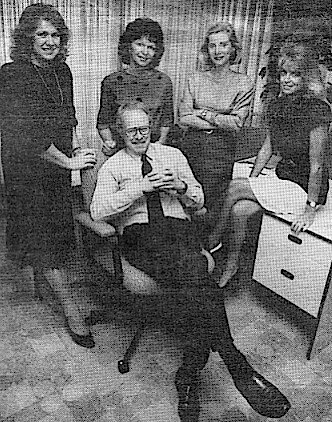 When Glenys resigned from Seven, Jill Glass took over in the Program Department. Glenys started with Network Ten during the 1987 America’s Cup coverage out of Fremantle and then joined Channel 10 Perth in the very early stages – prior to the station opening on 20 May 1988. Glenys worked originally out of her home address until an office in St Georges Terrace was established, to later become the top Program executive at NEW Channel 10. Interestingly, Glenys has been an integral part of the City Beach Netball Club whose origins coincide with that of TVW Channel 7, as both entities began in 1959. Glenys participated as a player, coach and mentor for the City Beach Surfers, which has Marj Williams as its President since its inception. Glenys played netball for City Beach Surfers from 1964 to mid 1980’s with a break for only two years (to have two children, 1974 and 1975). Glenys gave 49 years of dedication to the club, coaching teams up to 2009. 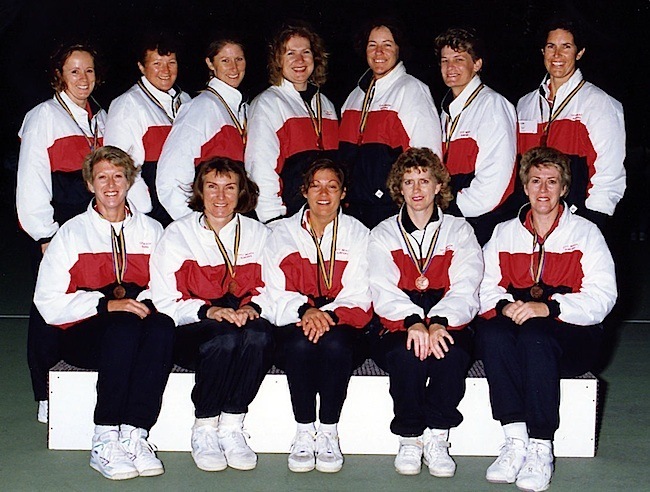 Glenys started coaching Junior teams and then moved to the Seniors. including the Division 1 team to Premierships during the 1980’s and many other premierships in other grades over the years. Graeme Plummer remarked how in the early years at Seven, Glenys would proudly return to work on Monday mornings, all black and blue with legs scratched, following the weekend battles on the netball courts. As a Netballer, Glenys was an extremely talented player, a National and State representative, a past Netball WA Board and staff member and an outstanding volunteer. Netball WA describes Glenys as an incredible shooter. 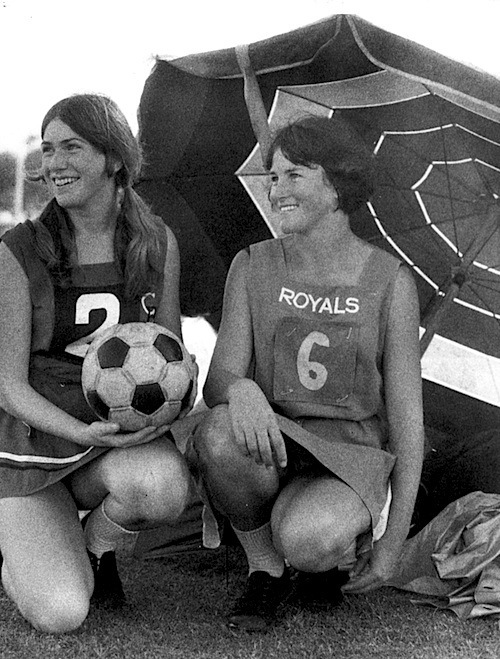 She was part of the State Representative pathway from 1963 when she was a member of the State Schoolgirls Squad. From there it only took her four years to reach the State Open team and not long after a place in the National side in 1968. Touring with the Australian team to New Zealand in 1969, Glenys was always a fine representative of Western Australian netball talent. A life member of the Perth Netball Region and Perth Netball Association, Glenys was involved in the game at many levels – from a player and coach at City Beach Surfers Netball Club to being the Manager and Executive Director of Perth Orioles (2000-2001), a team which was formed to compete in the Commonwealth Bank Trophy (CBT), a major national netball competition in Australia from 1997 to 2007. Since 2008, the team is now known as West Coast Fever. Netball WA also point out that they were fortunate to have had a woman with Glenys’ capabilities within it’s ranks, and as Vice President of the Board in 2001 and a delegate to the Netball Australia Council from 2001 to 2004, she was an advocate of ensuring that netballers throughout the State and Country always reached their potential. Over the past two years Glenys was a Perth Lions Director, with the Perth Lions Netball Region honouring her with a 2010 Life Membership. 2004 Executive Director, Perth Orioles assisting in the running of the team in the CBT competition and ensuring financial viability of the team. Liz Booth kindly advised that when a friend took leave at the Osborne Park Hospital, Glenys was to fill in for a month in administration, where after they felt privileged when she stayed for six and a half years. Pointing out that Glenys was one of those amazing people, who they were all the richer for knowing as a result of her kindness, humour and many abilities. Undoubtedly, people will remember Glenys as a very special lady and will miss her beautiful smile, calm presence, strength, humour and positive nature. For she had a courageous spirit with a love of life and was of great support for others. 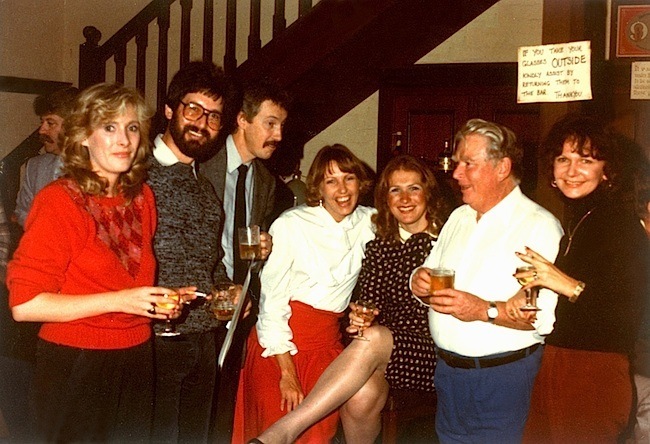 L-R: Jo-Ann Ledger, Jamie Martinovich, Alan Richards, Val Sutherland, Glenys, Ken Kemp and Marion Leyer. In the background is Bernie Connell. Her family have described Glenys as a beautiful caring daughter, a wonderful, gentle, brave and gracious sister, joyful sister-in-law, good friend, talented netballer and fabulous wife, mother and aunty, who will leave a very empty place in their lives, but lots of memories to treasure. Interestingly, Glenys was born on the birthday of her mother Doris, and shared 62 birthdays together. Sincere condolences to husband Rick, son Rowan and daughter Tegan and families on the sad loss of Glenys. Bill McKenzie was first to alert us of Glenys’ sad passing…. “Very sad to advise that Glenys Gill passed away this morning after a very brave fight. The courage that Glenys has shown during this long battle absolutely incredible. Just the most wonderful friend, loyal, thoughtful, kind and an inspiration to us all. Phone has been running hot, not at all surprising to learn how many people were touched in so many ways by GG. I`ve one story from about 1969. We`d been in a minor dispute with the Australian Broadcating Control Board and I had to show Jim Cruthers a letter I`d written them before it went. Trotted round to Jim`s office, handed over the letter and he said WHO TYPED THIS very loudly. As some may remember Jim was paranoid about correspondence being perfect and I immediately thought I`d missed an error. Anyway I couldn`t say I typed it so truthfully said ” Mr Cruthers… Glenys Andrijasevich. I`ll never forget Jim`s reply because if he was short on anything it was praise. “I`ve never seen a letter so well set out ….perfect, tell Glenys. Which I did later, and she was chuffed. 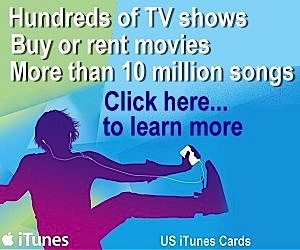 “Television guru, sporting champion, wife and mother. You were my television soul sister and you could see the big picture. 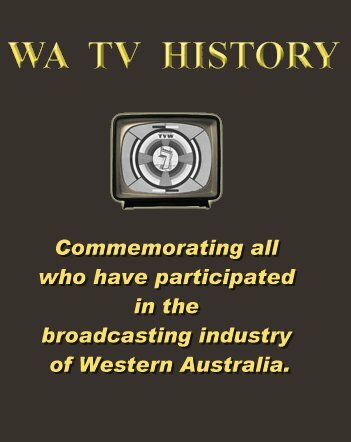 I remember the day we changed Australian television history with the first gulf war. We had exclusive access to a new-fangled thing called CNN and they were streaming live pictures from Iraq and the Scud missile attacks on Israel. We were the only TV station in Australia showing these incredible pictures and we stayed on air for three days straight. Ratings trebled and quadrupled and Channel Ten Perth was up with the big boys. I still chuckle when I remember how we hid the true costs for months but by then it didn’t matter any more. The money was in the bank. Rick and family, Yvonne and I share your grief. “Glenys was one of the “A Team” of people who worked at Seven. “Thank you for the very sad news relating to Glenys… it has come as a big shock. 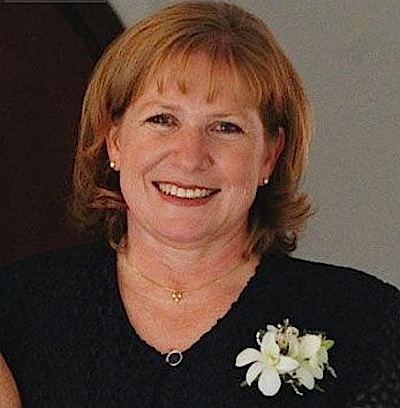 Glenys was a wonderful person to work with and helped me in many ways…she was a good friend to everyone who met her. I have found a photo of Glenys that was taken at the US Television screenings and I think I have my history correct… Rival TV Networks from Australia do not preview with each other but join up at social events. Glenys was at the screenings as part of Network Ten from Perth and I was at the screenings during my time at GWN. “I would describe Glenys as a gentle, loyal, diplomatic, gracious and passionate person and of course a lifelong netball lover. Her great sense of humour, fairness and generosity always meant that this was a special person and a friend for life. You can sit back now, close your eyes and see her with her beautifully groomed ginger hair, perfect makeup and the beautiful welcoming smile she gave everybody. She shut no one out – no matter what happened. Her love of her family, her netball girls, her basket ball girls, her running Harriets’, her friends from TV days meant that she had quite a few networks and in all I know she was cherished. Somehow they all inter-connected and she found time for everyone. I can remember when we were living in Subi Central and she was on a run she would pop in for a glass of wine and then pick up the girls on the next stretch – she fitted us all in! Through her whole illness Glenys researched, discussed options, and tackled treatment opportunities, went through so many small and big operations, numerous medications and programs and all with amazing determination. She never complained and seemed to have the ability to bounce back many times. I only remember her talking about, but not actually complaining of the difficulty she had once with sitting following an operation in a delicate area and her sore feet! Even in the last week we talked about her family, my family, netball days and with encouragement she would put on her foundation, a bit of lippie and look in to the mirror and give you her smile. She enjoyed her coffee, chocolates and huge slices of lemon slice I took in. Television veterans Jeannette Smith (Ashley), Sophia McLay (Stefanoff), Val Sutherland, Jo-Ann Ledger, Hilary Everard, Gwen Story (Andrews), Bob Page, Darcy Farrell and Ken Kemp also express their sorrow and contributed to this tribute. Also greatly appreciate the considerable input from members of the Netball fraternity: Gayle Watson-Galbraith, Liz Booth, Pam Whitfield, Carol Nevin, and Sue Trew. And a great thank you to Rick and Tegan Gill for their much valued help.